Hi there! Greetings from the snowy, ice covered reaches of New York! We hope today’s post finds you ensconced in covers and drinking the hot beverage of your choice if you are in one of the colder areas of the world. And if you are in Hawaii, well, don’t tell us if you are in Hawaii. 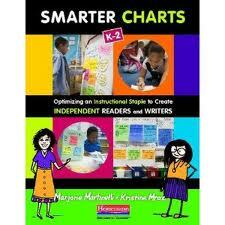 We chartchums have been busy writing, writing, writing and are happy to report that Smarter Charts 2 is now in the hands of the supremely dedicated and talented folks at Heinemann. We will keep you posted on its progression, and have one small teaser to unleash now… it is even better than the first book. Our brains have grown, our community has grown, and it has resulted in something we are both incredibly proud of. * Kristi learned this trick from a literacy coach, if you make the on-demand book a different color it is easier to find it. She chooses a different on-demand book color for each unit. Then, Kristi sat down with the on-demands and her end of unit checklist. 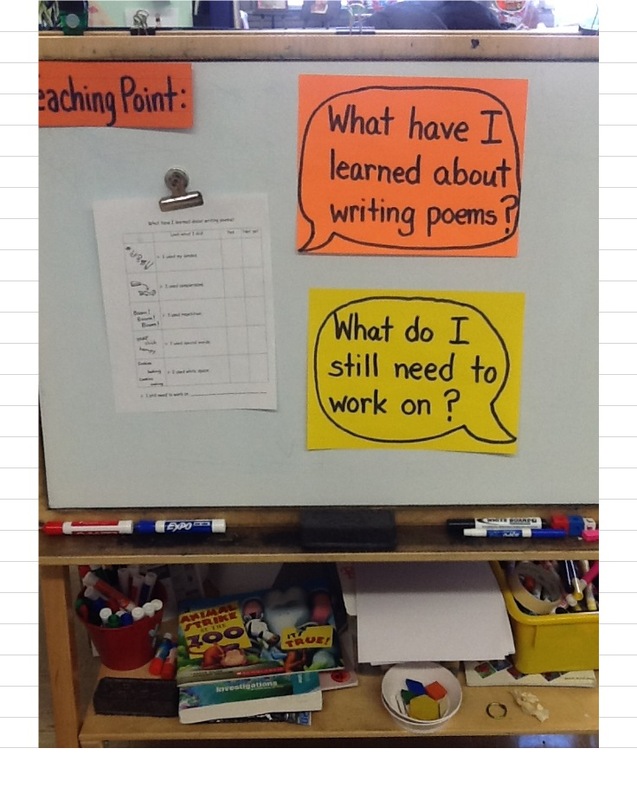 The headings at the top are strongly influenced by her work with the Teacher’s College Reading and Writing Workshop Narrative Writing Continuum and the Common Core State Standards. She will be teaching story multiple times throughout the year, so these are not the ONLY things she is teaching in narrative writing this year. There are some obvious small groups that pop up: children who need more work with stretching a story across pages or sequencing, coming up with topics, or children who had less than the average amount of stamina. Now that you know where you are, plan to move onward! At this point, Kristi grabbed four pieces of white printer paper and wrote the goals across the top (one goal per page). Kristi usually plans for 1-2 weeks of focus around each goal, but will probably only teach 3 or 4 things within that time to support the goal. This allows time for children to learn the new thing, practice and reflect on it. Below is the planning page for goal 1: Stamina On the left hand side there is space to generate teaching points, on the right hand side is a mock up of what the chart will probably look like. 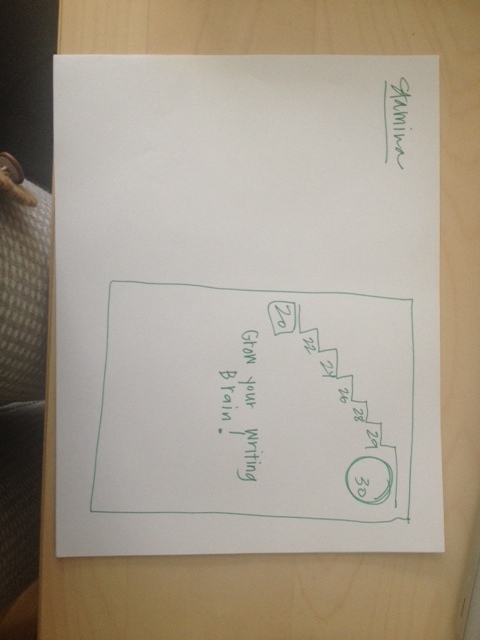 At the top of the chart there will be a stair of increasing minutes to record the growth in stamina. Underneath is the likely heading for the strategies to support increasing stamina. One can not just write longer by sheer force of will, it helps to have some techniques to help you stay at something. These are the strategies Kristi will likely teach, though she has since added: be optimistic, say, “I can do it” and add to your words. These are culled from a variety of sources: Teachers College Reading and Writing Project curricula, the second bullet comes from our resident occupational therapist, the newly added “be optimistic” comes from some of Kristi’s professional reading on growth mindset and grit. These are written in shorthand and will be mulled over to find the perfect language and the perfect method of delivery, this is the broad strokes of instruction. 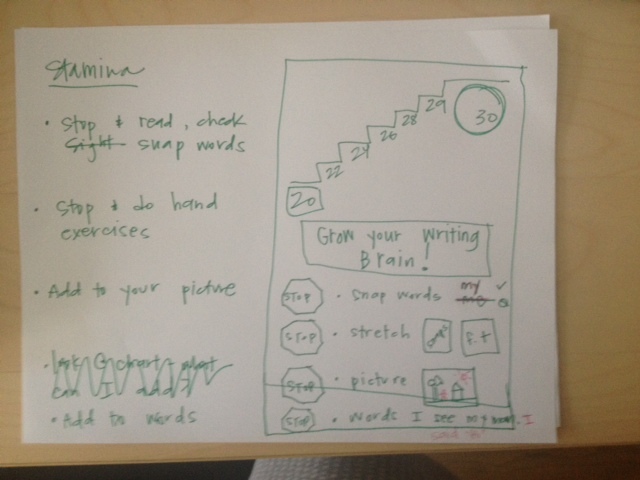 Next she translates her short hand into a further developed chart sketch. Note the reduction of language, the selection of a consistent visual, and the decision to use two colors to help children see what the strategy may look like in their own work. Next to the second bullet, stretch, Kristi has made a plan for the two photographs she needs to take. Two children that regularly receive additional OT services will serve as the models, mentors, and instructors for that lesson. Much of this sketch is just that, a sketch, much like when baking soda meets vinegar and the substance changes, when chart ideal meets child there must be room made for their influence. Some of this may be made during interactive writing, the work on the right hand side will be selected from students, and the strategies may change based on their accessibility and success. Kristi always, always, always leaves room for the innovation of her class. Let’s see it again, shall we? The second goal is elaborated drawings. Again, Kristi went to the white paper and thought about a variety of sources: mentor texts for illustration, Katie Wood Ray’s professional text In Pictures and In Words, resources from the art teacher, etc. 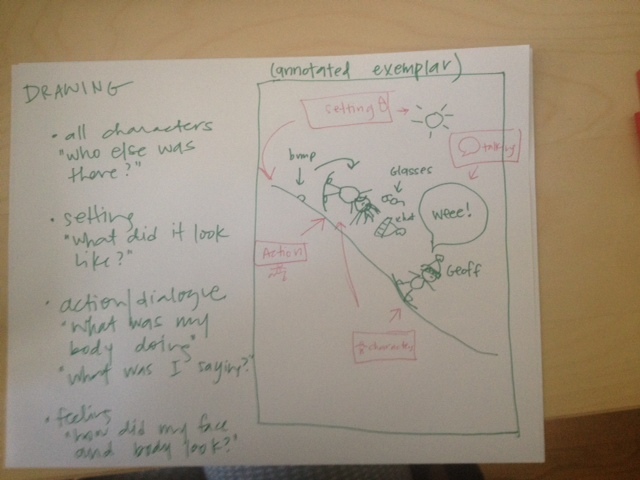 Kristi chose an annotated exemplar as the way to display this, as opposed to a list of strategies as the stamina chart will be, because she wants the children to see the big picture (no pun intended) of illustration. It is as much the way the parts work together, as the parts themselves, that make such impactful pages in picture books. Kristi will likely blow up both a piece of student work and a page from a Marla Frazee book to serve as mentors for the class. Kristi went through the same process for her remaining two goals, making both a list of possible teaching points and a possible chart for each goal. With all planning, one must be prepared for detours, delays, shortcuts, and running out of gas. Though she is planned, the plans are not poured in cement. The key to planning, in Kristi’s mind, is clarity of mission. If she can tease out 3 or 4 big goals, she likely has her charts. She often asks herself: what is reasonable in the amount of time allotted in this unit? She gives herself time to revisit teaching with her students, and tries to remember what really matters in writing: active problem solving, clear communication, joy, and ownership. As far as the charts, the key is remembering they are billboards or fliers for your teaching, they are not the teaching. Door to door salesman leave pamphlets, companies run commercials and print ads, people take notes from a workshop. The charts need to jog your students memories, not create them, so making them with your children is key. Less is almost always more, and pictures are worth a thousand words. We hope this helps to keep your new year clutter free, and as always, we look forward to hearing your comments! For some of you the 2012-2013 school year has come to a close, for others this week will be the last, and here in the northeast many schools won’t finish until the end of June. And then there are the many year-round schools across the country and lastly, summer school. 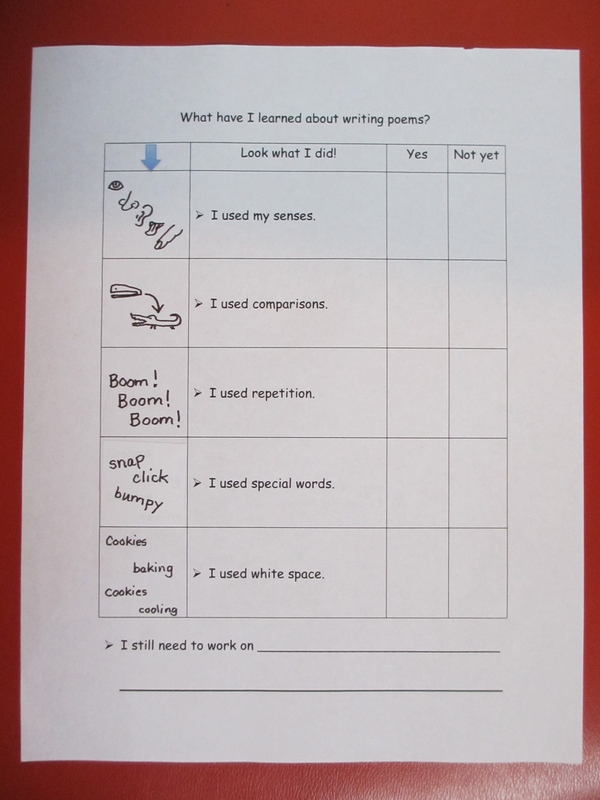 So whether you are gearing down or revving up, here are a few ideas to encourage your students to practice what they have learned with increased independence using charts and checklists to help them along. Setting kids up to have the mind frame that they can be in charge of their own learning and can help themselves solve problems as they arise is a life skill that will carry them far. At PS 176, an amazing school in Brooklyn where the majority of students are ELLs, Marjorie set the first graders up in Valeria’s class to ask themselves questions whenever they got stuck or weren’t sure how to solve a problem when reading and to use the charts and other resources in the classroom, not only as needed, but with flexibility as well. Bringing some of the strategy charts down and putting them back in front of the children also helps children reorient themselves to what you have taught. At this time of year, it is not so much new learning, as it is maintenance learning and review. 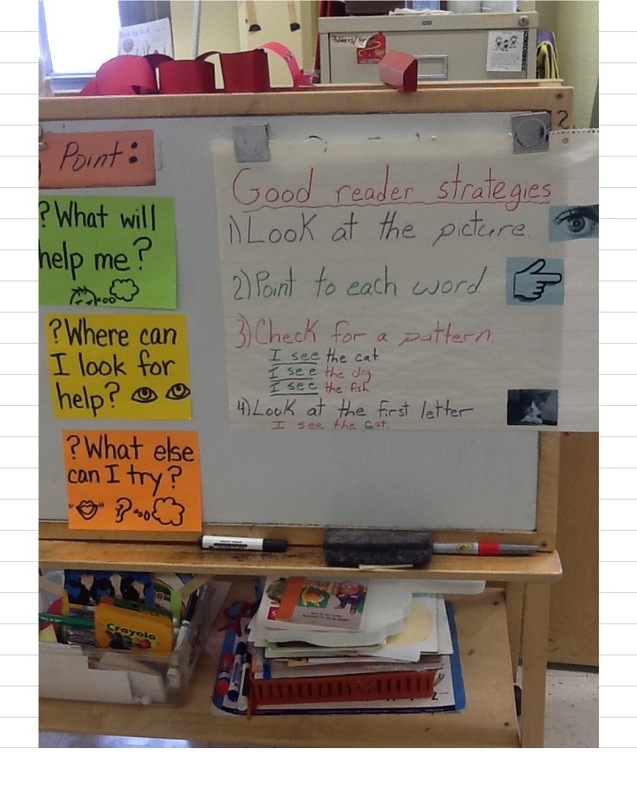 The left side highlights the questions, the right is one of the reading strategy charts. Questions to ask when using a checklist. Another area to build independence is with book clubs and conversations. Setting up a checklist to remind club members of how to get ready for a conversation and then to keep it going is one way to do this. 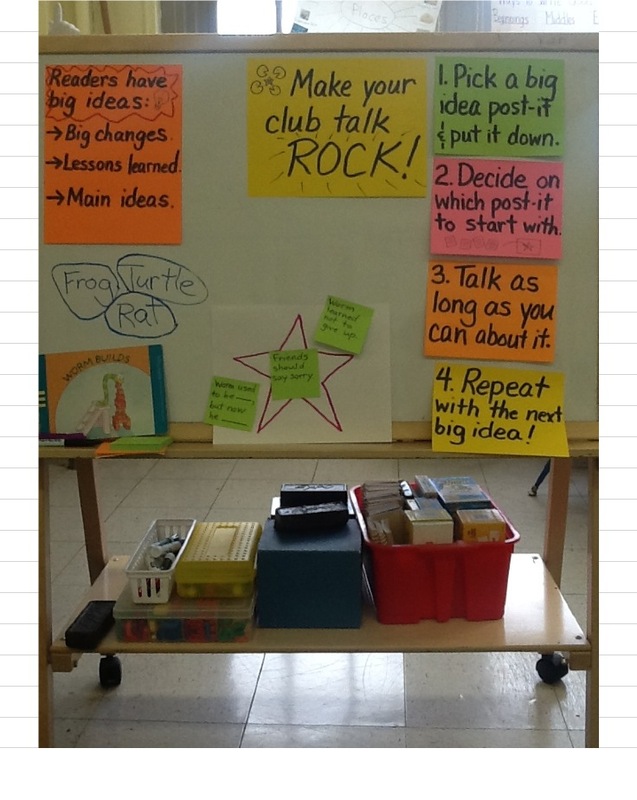 In Florence’s first grade class at PS 176 Marjorie showed the children a system to get their talk going by having each child choose one of their big idea post-its and put it on a talk mat (in this case it was just a piece of paper with a star drawn in the middle). Then the club decides on which idea they want to start with and moves that post-it to the middle of the star. The goal is to talk as long as they can about this idea before moving on to the next big idea. The photo below shows what it looked like at the end of the lesson once the children had tried this out on a shared class book, Worm Builds by Kathy Caple (Brand New Readers). Some of the ideas generated by the class were, “Worm used to be worried, but now he is confident,” “Worm learned not to give up,” and “Friends should say sorry,” which they chose as the one to start the conversation with. Each club was then sent off with their own star talk mat and checklist to remind them of the steps without the need for a teacher nearby. The children in each book club were focused and intent, the talk energetic and dynamic. Make your book club ROCK! In Pamela’s kindergarten class at PS 176 she was revving her children up for first grade by showing them ways they could post-it in their books during their final unit of study on character. The first lesson Marjorie taught was on noting character feelings and when a character’s feelings change. Once again she used some of her favorite books from the Brand New Readers series to model and practice with (Worm Builds and Piggy and Dad “Play Ball!” by Frank Remkiewicz). 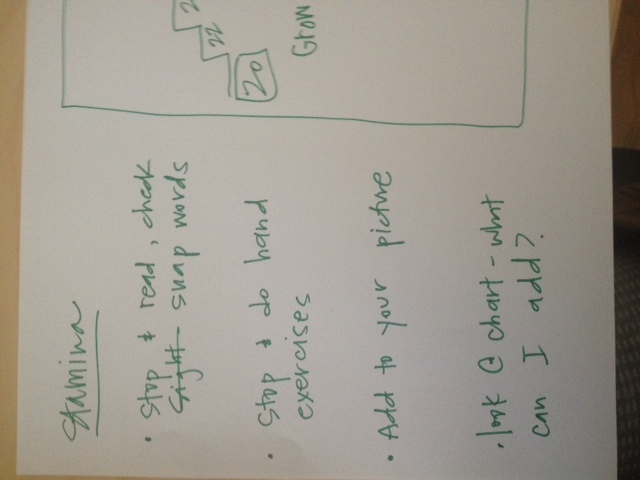 The photo below shows the beginning of a strategy chart. 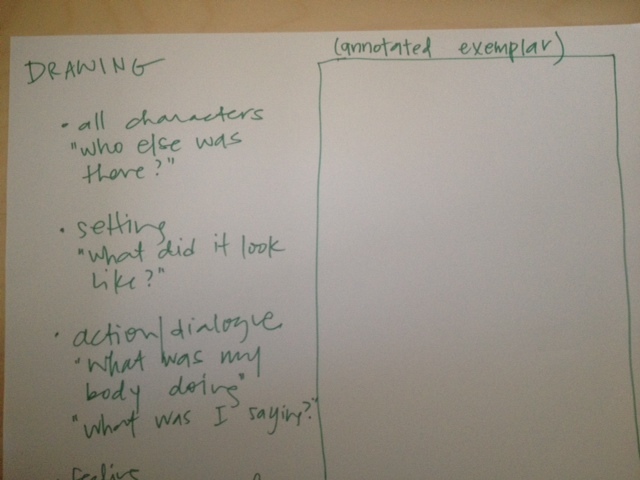 The chart includes not only visuals, but some sample post-its kids can refer to as examples. Pamela did a follow up lesson on revising some of the feeling words that were very general like “happy” and “really, really happy” since one of the goals of this unit was increasing vocabulary for her large percentage of English Language Learners. 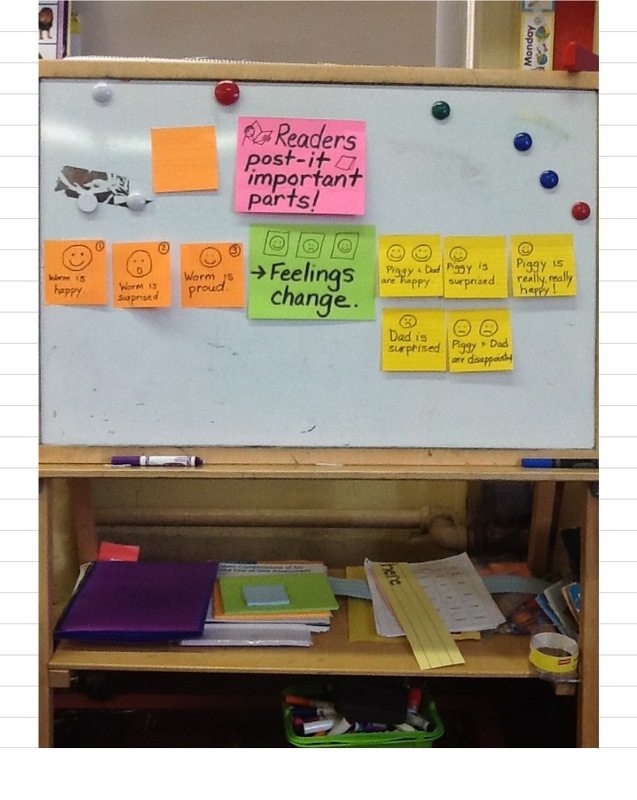 Another follow-up lesson was on using the post-its to do inferential retellings of stories. 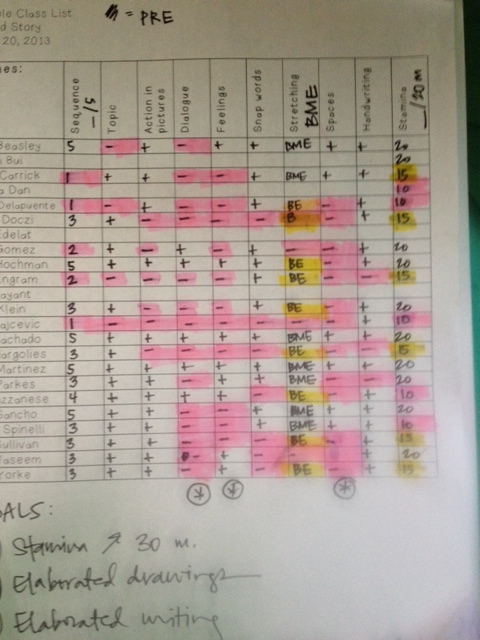 Post-its help track when a character’s feelings change. We hope this helps whether you are gearing down or revving up for the days ahead!